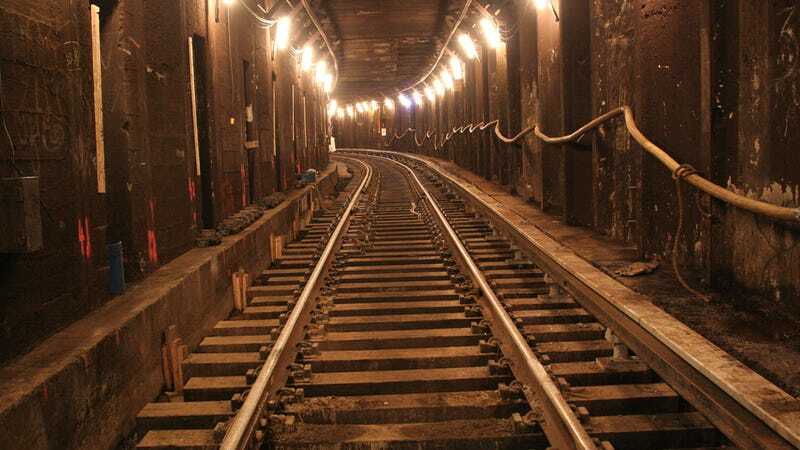 The New York City subway is inundated with 13 million - 13 MILLION – gallons of water a day. Every day. Every dry day. If it’s raining, it’s full of even more water. And it turns out a big part of that is because our great forefathers before us had absolutely zero clue what they were doing. The island of Manhattan the core of New York City is now mostly a nice rectangular landmass that is completely, perfectly smooth and dry. That is not how it’s supposed to be. That’s the Viele Map of 1874, which depicts all of the rivers and streams that originally criss-crossed Manhattan (you can see a truly enormous version of it here). The light green is the original landmass of the island, with orange denoting landfill of the time (of which there’s a lot more now), and dark green marking out the original waterways. Today, Broad Street sits right on top of where an East River inlet once was. Minetta Creek? That’s now Minetta Lane. Its headwaters were right by where the Jalopnik office now is, at 21st street and 5th avenue. Where the upstart and poorly designed 2nd Avenue Subway line now is? Well, that was just a veritable rat king of rivers. But those familiar with Manhattan and/or Google Maps can attest that the island, today, has none of that. It’s all been paved over and buried over the centuries after Europeans arrived, with Minetta Creek notably hidden around 1820. It’s incredible hubris, however, to think that just because you made something as powerful as running water disappear from plain sight, that it just went away entirely. But all of those rivers and streams are still there, somewhere, buried beneath the busy and bustling city above. All of that water that was once flowing through the surface now flows underground, where the subway is supposed to be. And in turn, it contributes to its ruin and downfall. The subway system now has a system of 289 pumps to get it all out, the New York Times notes, and it can even handle an additional 1.5 inches of rain per hour, but sometimes that’s still not enough and everything starts going down. You may have thought that the New York City subway is hot garbage because of corruption, or poor planning, and/or maybe dead bodies. But no. A large part of it is also because New York City was built in entirely the wrong place to begin with.